Yves here. I’m a big fan of economic history (and mystified that contemporary economists so rarely take interest in it). Pilkington describes an illuminating and oft-neglected chapter. By a series of controls, they reduced to the minimum consistent with their rearmament program, all private issues which might have competed with Government issues for the limited funds in the capital market. Thus, the capital market was, in effect, pre-empted for Government issues. Next Schacht seized control over the foreign exchange market to ensure that only those goods that were truly needed for the war machine — such as raw materials — were imported. This was referred to as the ‘New Plan’. There were three main features of the “New Plan” as devised by Schacht: (1) restriction of the demand for such foreign exchange as would be used for purposes unrelated to the conspirators’ rearmament program; (2) increase of the supply of foreign exchange, as a means of paying for essential imports which could not otherwise be acquired; and (3) clearing agreements and other devices obviating the need for foreign exchange… These agencies, which were under Schacht’s control as Minister of Economics, decided whether given imports and exports were desirable; whether the quantities, prices, credit terms, and countries involved were satisfactory; and in short, whether any particular transaction advanced the conspirators’ armament program. In addition to this Schacht took advantage of the clearing system that existed (and basically still exists) and allowed other countries’ exporters to send Germany raw materials in exchange for claims on the German clearing house. These claims are then only paid when Germany stops running a trade deficit and begins running a trade surplus. What follows is an amazing moment in Nuremberg where the truth of the international clearing system is laid bare for all to see. The principle of the clearing system is as follows: The importer makes a deposit of the purchase price in his own currency at the national clearing agency of his country, which places the same amount to the credit of the clearing agency of the exporting country. The latter institution then pays the exporter in his own currency. Thus, if trade between two countries is unequal, the clearing agency of one acquires a claim against the agency of the other. That claim, however, is satisfied only when a shift in the balance of trade gives rise to an offsetting claim. This device was used by Schacht as a means of exploiting Germany’s position as Europe’s largest consumer in order to acquire essential raw materials from countries which, because of the world wide economic depression, were dependent upon the German market as an outlet for their surplus products. I believe what Schacht is here getting at that, as Keynesian economists know well, it is the demand-side of the economy which is important in most respects. The supply-side — the producer — is of secondary importance. Schacht also invented what was called the ‘aski’ system to ensure that money paid for imports was then only spent on German exports. This seems to have been done through negotiation and, despite the sometimes moronic trade laws that exist in our world today, would certainly be worth another look by development economists should we ever move into a more enlightened future. This scheme likewise obviated the need for free currency (i.e. Reichsmarks freely convertible into foreign currency at the official rate-U. S. dollars, pounds sterling, etc). The system worked as follows: The German foreign exchange control administration would authorize imports of goods in specified quantities and categories on the condition that the foreign sellers agreed to accept payment in the form of Mark credits to accounts of a special type held in German banks. These accounts were called “aski”, an abbreviation of Auslander Sonderkonten fuer Inlandszahlungen (foreigners’ special accounts for inland payments). The so-called “aski” Marks in such an account could be used to purchase German goods only for export to the country of the holder of the account; they could not be converted into foreign currency at the official rates of exchange. Each group of “aski” accounts formed a separate “island of exchange” in which the German authorities, under Schacht’s leadership, could apply their control as the country’s bargaining position in each case seemed to warrant. Schacht’s ‘New Plan’ for the foreign sector of the German economy was enormously successful and probably contributed significantly to the low inflation in Germany in those years noted above. But what was going on at home? We know that Schacht had suppressed the capital market in what can only be described as the ultimate historical instance of ‘crowding out’ and we know that he had freed up the fiscal system to be used in any way he pleased but what was going on in domestic industry? It is to this we now turn. Schacht adopted a host of controls over the productive mechanism of Germany, extending, inter alia, to the allocation of raw materials, regulation of productive capacity, use of abundant or synthetic substitutes in place of declining stocks of urgently needed materials, and the erection of new capacity for the production of essential commodities. The structure of regulation was built up out of thousands of decrees in which governmental agencies under Schacht’s control issued permits, prohibitions, and instructions These decrees were the outgrowth of carefully laid plans of the Ministry of Economics, of which Schacht was the head, concerning “economic preparation for the conduct of war”, and in accordance with its view that “genuine positive economic mobilization” demanded that “exact instructions for every individual commercial undertaking are laid down by a central authority’. All in all there is much that can be learned from Germany’s experience in the 1930s. While their attempts to control production and consumption directly are probably not suitable outside of warfare or rearmament Schacht’s monetary manipulations were, by any standard, rather ingenious. They were also extremely brave in that they had never been tried before and Schacht was not, so far as I can see, working off any truly articulated Keynesian theory. Rather he was working from the basis of intuition — an intuition, it should be noted, that was rather sharp. So, what happened then to Schacht? Well, it turns out that he was not the monster those he worked for undoubtedly were. Even the prosecution conceded that “he was not in complete sympathy with that aspect of the Nazi Party’s program which involved the wholesale extermination of the Jews” and that he “gave aid and comfort to individual Jews who sought to escape the indignities generally inflicted upon Jews in Nazi Germany”. That is more than can be said of many German soldiers and officers who went home to their families after the war. Nor was Schacht an official member of the Nazi party, in fact he was a former liberal politician. The Soviets, who wanted to convict Schacht, saw him as the man who had, through his economic genius, facilitated the growth of the Nazi war machine. The British, on the other hand, saw him as another instance of a common character type: an ambitious functionary who tied himself to the power structure in Nazi Germany while maintaining his distance and they favoured acquittal. In their own way, both sides were probably correct. But Schacht was acquitted and he went on to found a bank and give economic advice to developing countries. My guess is that this advice was far superior to that given by modern day economists. This entry was posted in Guest Post, Macroeconomic policy, The dismal science on December 12, 2013 by Yves Smith. Anybody who knows anything about those years would tell you that Germany engaged in a very limited military expansion of its machine power when compared to the total French ,Russian and British(naval) forces. For example – If we look at total tank production vs French production the Germans merely produced lighter tanks in greater volume or seized tanks from Skoda works later in the 1930s. This was the very reason for its Blitzkreig tactics – it did not have the resources for a long war. Reading authors such as Len Deighton or Clark one gets a very different impression of German machine military capacity only rectified by Speer much later in the war. Before that time both the UK and Russia had engaged in a much more standardized & larger production process. We can see quite clearly that Germany was a fiefdom of various tiny corporate bodies competing for a very small share of total economic output when compared to the UK. Looking back now it seems Germany only increased production much later in the war after imposing a proto Euro system on the continent. Bill Still has a different take on Schacht although he still thinks Germany was a military powerhouse again mistaking tactical success for strategic ability. I am not sure on Stills accuracy but what we know for a fact is that Germany used the resources of France ,eastern Russia etc in a very different fashion from the UK & its colonies. Germany lost the war because it did not engage in total war. Germany remained in a colonial mindset until Speer – while England junked the colonial mindset during total war periods ,throwing everything it had against the enemy. How is this relevant to the post? Pilkington wasn’t writing a military history. Please stay on topic. You regularly use post to offer very lengthy commentary that is at best tangentially relevant. A little is fine, a steady diet is not. Schacht used debt instruments to sustain private consumption as the military machine was growing in Germany. If private consumption tanked in Germany during the 30s then the population may not have been so enthusiastic for miltary parades. Again he duped the populace into thinking they could have both guns and butter. I think its very relevant. I don’t have the link, but about a year ago someone on Brad DeLong’s site took Niall Ferguson to task for not knowing about Schacht and how he saved the German economy. Schacht told Hitler to ignore the WWI reparation payments because it drained the German economy, and to concentrate instead on helping the German people who were devastated by WWI. Schacht believed in Hitler until 1938/39. (I’m doing this from memory, and the dates could be faulty.) Nevertheless, Schacht was effective, and he turned the German economy around; then he became disillusioned with Hitler and his aims, and it led to his incarceration at a concentration camp and his eventual clearance, after accusations, at the Nuremberg trials. This history is not in dispute. But you cast a pall over Schacht that I think is unwarranted. Oh, I don’t know. I think “useful idiot,” and maybe especially “technocratic useful idiot” is a very important concept and one that should be developed far more than it is. It is true that it is too easy to identify useful idiots after the fact, but if prospective useful idiots, and maybe especially prospective technocratic useful idiots, recognized the fullness of their potential in the first place we wouldn’t have arrive at the point where they’ve actually lived up to it. So Schacht grew the economy via debt issuance , not money issuance. This is why the German state of the late 1930s (even up to 1942) could have both bread and butter in contrast to the UK although with its colonies more or less intact. With a more national money based system you need to make a choice ……. How is this argument applicable today ? We are in massive debt already!!! Well perhaps if we look at the German state today we can make a analogy. The modern German state & the eastern lands now builds the tanks (cars) of the modern neo Keynesian state(where war like products are now sold for private consumption) but if you can no longer expand tank (car) production what do you do ? You contract butter consumption in the periphery………….so as to continue with your tank (car) production. We can see how Germany lost the war now. There was a inertia in private consumption patterns which made the switch over to a full war economy difficult. This can be seen in the Autobahn programme which the Prussian officer staff resisted because of its heavy use of raw materials which could be directed elsewhere into the war economy. In simple terms we can no longer sustain this 100 year old Keynesian war economy experiment without again destroying millions of lives. The German army utilized nearly twice as many horses (2.7million vs 1.4 million) as the first world war. By the Winter of 1943/44 only 16 % of German divisions were fully motorized. The British fought a capital heavy war of air and sea power while the Germans threw man and horse flesh into the battle. This was a failure of the financial and industrial system of Germany if the aim was to build a war economy. The British fought the capital-heavy war because from June 1940 to June 1944 it was the only sort of war they could fight, except in N. Africa and Italy. PP might have related the aski agreements to German economic imperialism in southeastern Europe, which relied heavily on bilateral trade arrangements involving raw materials–Rumanian oil a particular target–in return for German manufactured products. exactly …….plans for a capital intensive war were made in the UK many years before its outbreak. British Strategic preparations for total war began in the early 30. By 1936 Bomber command had formed . Bomber command was not a tactical fighting machine designed for war in France. They could have made other choices. But the people behind Chamberlain made the decisions many years before the war started. The Bomber factories took 5 to 6 years to build but they started in 1936 !!! My point is Schacht did not aid the German war machine during the 30s. 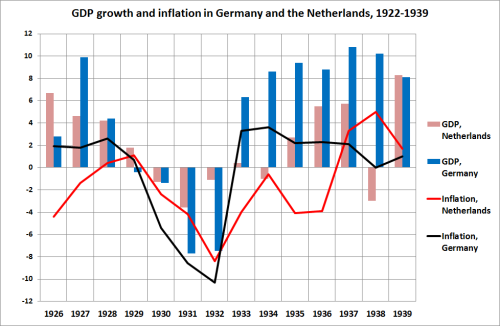 The German economy was much more consumerist then the UK. This carried through into the war. If you define a economy by its military strength as the Germans did in the 30s and yet are unable to produce the goods needed for such a war then your objective has been a failure. Phil talks about monetary stuff as if it were real goods. As if John Law was the perfect man to raise a army….. In wars of this period it comes down to production and in the final anylasis Germany could not produce the goods in quantity despite having seized geographical areas of arms production even before Sep 1939. People mix up tactical blunders in Norway and France with the war economy but France had more then enough Tanks and aircraft of quality to fight. In one case 200 French aircraft remained in Tours for the entire Battle of France !! Hitler delayed optimizing the German economy for war output until the failure of the Wehrmacht to capture Moscow in the winter of 1941. Until then he had assumed the war was going to be short – and it very nearly was. Now as for your point regarding horses and motorization, full motorization of the German army -or even a large part of it- was completely beyond Germany’s industrial capacity, even if Hitler had committed to maximize military production from the start. The postwar myths about German mechanization stemmed in part from the fact that while the mechanized forces only accounted for about 15% of the divisions mobilized by Germany at the start of the war they played a decisive part in the early campaigns, and frankly also because it was comforting (if untrue) for the Allies to believe that the early string of humiliations they endured was due to being outgunned rather than outgeneraled and outfought. The Western Allies achieved something approximating a mostly mechanized army in the campaign in Northwestern Europe in 1944-5, and they could do this because the US’ industrial capacity was vastly greater than Germany’s (the British army in 1944-5 being equipped to a significant extent with American materiel). In fact if you want to understand the course of the Second World War all you really have to do is compare the industrial output of the Allies (mainly the US and USSR) with that of Germany (the output of Germany’s allies being almost insignificant). On that basis alone the war could hardly have ended otherwise. But I cant remember any WW2 movies with nazis on horseback! You should write a book on the subject instead of hijacking other people’s blogs. The British fought a capital-intensive war because they fielded a very small and rather awkward and underwhelming army. They also did it because they had access to vast material, industrial, and financial credits from the US and Canada (Canada’s role in Britain’s ability to fight WWII is critically underrated). Germany could not get away with having a smaller army than Britain and France combined. She also feared a Soviet attack (which some Russian authorities now say Stalin was planning for 1942). So you are comparing apples to oranges. The best modern works on the subject are Maiolo’s Cry Havoc and Tooze’s Wages of Destruction. I’d check both before making any sweeping comments about German rearmament and strategic policy. yes I am familiar with Bomber Command and the Canadian connection for training as well as raw materials. The German army was of course the senior service for the Germans……..if so where was the Tanks & more importantly the trucks ? To believe the mythology of German propaganda from that time is not a accurate historical exercise. Germany was a series of craftwork shops in the 30s……my question is why and most importantly why did they not prepare for a long war given the past experience of the Great war. German mass production was a emergency measure late the war but it was built into the UK system from 36 !! Hitler wanted maximum strength as early as possible so that the period of vulnerability to outside intervention was reduced to a minimum. That meant many infantry divisions right away. This lead to the “rearmament in breadth” versus “rearmament in depth” argument that the “depth” side lost in Germany. It must be remembered that a crucial difference between Chamberlain and Churchill was over this very issue, and it was Chamberlain who most ardently fought for rearmament in depth, i.e. lots of initial investment in plant and equipment, not so much in day-to-day armaments manufacture. The British accepted fewer planes today so as to produce more planes tomorrow. And historians of a certain stripe, who just don’t get it, have been ignorantly holding that against Chamberlain for 75 years. If Germany expected a land war……………….. I think the relevance is clear enough. There’s too much emphasis on Schacht but point taken. Galbraith said that the reason the German successes in overcoming the depression are consigned to intellectual oblivion is that Hitler cannot be accused of anything good, aside from autobahnen. Hitler had contempt for bourgeois values and associated traditional finance with a Jewish plot to enslave humanity, so people with heterodox (Keynesian) ideas were able to put them into practice full tilt. What an odd post about a rancid opportunist who changed his stripes so often it’s impossible to assess what he stood for and also what he actually accomplished. Schacht was was known as Hitler’s banker, but Hitler later fired him. Schacht was a committed fascist who found the NAZI’s repugnant, yet his patron was none other than Hermann Goering–aka “Schacht’s Guardian Angel”. Schacht was a committed Freemason (in the Scottish Chapter of all things). He was straight out of the JP Morgan School exemplifying the Rise of the Financier to dominate modern life. He even continued to defend the Gold Standard in his autobiography written in the 1950s, btw. That’s just funny. Schacht, evidently was too sleazy for even Hitler. Maybe none of this is relevant to our current economic plight; except that when Pilkington writes about the “ingenious” exercise of control over the German Economy, this inevitably leads to somebody being in charge. Too often, we’re left with a contorted, ethically-free Freemason like Schacht. Lol! Do you buy into this stuff? lol. I for one take an almost mechanical look at an article like this, it doesn’t matter if he went home and shot puppies what matters is what did they do and not do economically just as if one wants to look at how Stalin turned the Soviet Union into a superpower almost overnight, yes he did some evil things but he also created one of the most comprehensive unlimited no limits welfare systems the world has seen and people shouldn’t let there feelings about a person get in the way of a full analyses of what went on or what they did weather they like the person or not. And as a side note this is why economics should be almost considered a religion because people analyze and make decisions based on how they feel and there emotions rather than rational decision making which is why we come up with the unfounded government should be run like a business meme and homeless people must die because feeding them doesn’t add to the bottom line. And sometimes a government is needed to do things rather than wait for the private sector to do it as we can see with the 3rd world but people have this belief that the public sector is evil so we will just sit around and wait till the private sector builds a car factory and computer chip plant in Bangladesh. Call me when that happens. Didn’t Robert Rubin do this too, create a demand for Chinese goods and pay for it with money that could only be used to buy US exports? Keeping inflation down by domestic rationing? It wasn’t a true wartime economy, but we had had a peculiar wartime economy of guns and butter since at least LBJ, which bankrupted us in the 70s – and the MIC still remained (and remains) the core of the economy. So this use of demand for imports to drive an economy goes back to Schacht, and no earlier? I find that hard to believe considering the very long history of human warfare. I have read that US foreign aid programs are run that way. The money is designated so that American products must be bought when accepting it. So that, say, Mozambique accepts American aid and its health department isn’t allowed to buy cheaper generic drugs but must buy name brand American pharmaceuticals at much higher price. I believe Marshall plan money was similar. the other fact is that yes, the US has been running a military based stimulated economy since WW2. I also think that is why the various stimulus programs haven’t had the effect they wanted since the initial stimulus effect is the most effective and that was already used up. So in the 80s, the US unions were broken so we wouldnt’t have the price wage stagflation of the 70s and debt was used to keep the economy growing. Now we are at the end of both and neither more debt or more stimulus is going to fix this broken economy. Yves, It wasn’t neglected by Laiquat Ahmed in his The Lords of Finance. But you are right for the most part. Some have even said that history in a real science isn’t necessary, and as economics, in their lights, is a real science, economic history becomes an irrelevance. There are so many ways in which this perspective is deeply wrong, and the field suffers as a consequence. Economics, done right, is a social science and therefore different in essential respects from physics, which they are doing their best to imitate, albeit inevitably inadequately. To say that economic history is irrelevant is like saying that layers of sediment are irrelevant to geology, that fossils are irrelevant to biology, that ice cores are irrelevant to climate science. Etc., etc. Great examples, Min. I wish I had thought of them myself. Currency controls were imposed in July 1931, effectively taking Germany off of the gold standard a full 18 months before Hitler became Chancellor. This freed the Reichsbank to to pursue expansionary monetary policy, which according to Peter Temin, it had started by at least the summer of 1932. .Germany’s industrial production reached bottom in August 1932 and had already increased 6.8% by January 1933, the month Hitler entered office. By April 1934, when Germany issued its first MEFO bill, and started running its first “large” deficit (about 5.4% of GDP in FY1934 according Albrecht Ritschl, counting the “shadow” budget), industrial production was already 45.8% above the level it had been in August 1932. Hjamar Schacht only became Economic Minister in addition to being Reichsbank President in August 1934. Thus by the time he presented his “New Plan” the following month, the economic recovery was already well underway. According to Robert Hetzel unemployment averaged 13.8% for all of 1934, already down sharply from the 28.1% rate it averaged in 1932. As Barry Eichengreen and others have noted, Nazi Germany’s introduction of expansionary fiscal policy in 1934 proved to be rather anticlimactic. P.S. What about the Netherlands? The order of economic recovery from the Great Depression followed in the exact order that countries devalued their currencies or detached from the gold standard. The Netherlands was part of the “gold bloc” of countries (i.e. France, Italy and Poland) that devalued late in October 1936. P.P.S. The industrial production data comes from the League of Nations. There were a lot of things Germany did policy wise that helped production that I doubt would have happened without it such as providing small farming communities with a community tractor they could share and use for free usually under the supervision of the mayor and they also did provide and make sure industry received the machines they needed. Yes, Hitler got all the credit for something that had started before he took over. Given the size of the fall in the economy before the recovery began, they were bound to have a huge re-bound once growth started again. This sounds right. Money from the US was pouring into Germany in an attempt to create a firewall against soviet communism, beginning in the 20s. Germany was up for grabs by all the industrialists of the capitalist world. So what Schacht did was ordinary fascism to prevent that inflow from reaching German citizens, and going into the war for profit enterprise already underway. I do not like to conflate MMT, using sovereign money to run the business of the nation without resorting to international financial cartels, with military dictatorship finance. What if financial cartels and militarization are the business of the nation? Or to put it another way – A Keynesian (in this case war) economist wishes to create scarcity via capital overproduction. This must create inflation as goods are either destroyed or depreciate over time. Like many Keynesians he picks a too short a time period to analyze inflation trends , 5 years ? France was engaged in a equal if not bigger Rearmament post 1938 and yet……..
People have no memory of that time but France was considered the most powerful army in Europe until the fall. People have a completely skewed version of events on the ground. People were shocked at the fall of France for a reason. It was the biggest fish in the western European pond. Again look at the data ………….Where were the German tanks ? Suffice to say if the Weimar Republic had tried any if this, the banking/finance groups would unite to ensure it would never happen. In fact, they might even enable limitless money printing to bring about the downfall of a democratic experiment. Wait … that’s a story for another time. This history also demonstrates the international cooperation needed to support the rise of the fascists in Europe. The Germans/Schacht didn’t figure out some clever way to get around the system, international finance worked together to rejigger the system to avoid public detection. That is interesting history. Basically, renouncing old debts, creating new debts, imposing capital controls, throwing up trade barriers, directing resources toward military production, implementing compulsory military conscription, pursuing foreign expansion/aggression, and so forth, helped spur a short-term economic rebound that ended in cataclysmic social collapse as the enablers of power lost influence with the psychopathic authoritarians running the show? I agree very much that there are some important lessons to learn from political economy in Germany of the 1930s. Philip, does the third reich system of payment for infrastructure projects in labor certificates relate to this at all? Thanks for putting up this post. Dr. Schacht was a fascinating figure, closely associated with the rentenmark and the ending of German hyperinflation long before Hitler became Chancellor, and later an extraordinarily agile and open-minded economic manager who wrestled with problems we should probably now think of as problems of development economics (capital scarcity, managing balance of payments/trade problems, the role of dirigisme) with extraordinary ingenuity. I don’t know whether he was a “good guy” or a “bad guy” – probably just a sentimentalist about the good old Hohenzollern days. Lots of Hitler supporters were like that.